Studies at our Department are focused on psychosomatically oriented approach to dramatic culture and creation, to authorship and concept of play. The key disciplines are Dialogical Acting with the Inner Partner, Authorial Reading and Authorial Presentation. The Department also conducts research in cooperation with the Institute for the Research and Study of Authorial Acting. The Department was founded in 1992 by Professor Ivan Vyskočil, a renowned actor, writer, psychologist, performer and educator, a prominent figure in Czech absurd and small-forms theatre of the 1960s. After him, the Department was directed by Professor Přemysl Rut, a playwright, actor, writer, pianist and song writer and interpreter. Currently, the Head of the Department is Michal Čunderle, PhD, a theatre theoretician, publisher and author of fairy tales. The Authorial Acting Program in English is led by Dr. Eva Slavíková, a psychotherapist and theoretician of the psychosomatic disciplines and Dialogical Acting. There are currently about forty Czech and international students at our Department. You can find out more about the Department and what we do here at the final exams that take place at the end of each semester and are open to the public; at the student 'Festival of Authorial Creation Nablizko'; in several our publications, performances and at other occasions. We regularly open courses of Dialogical Acting for students of other universities as well as the general public, both in Czech and English language. We also organise a two-year course of Creative Pedagogy. 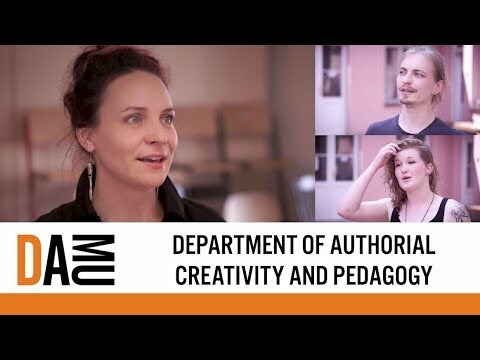 Promotional video made by students of the Department of Authorial Creation and Pedagogy of DAMU Prague. Head of the department Michal Čunderle explains the subject that is taught in class. A 2 year English Language MA Program. A 3 year English Language BA Program. Short Term Studies are also available, with no degree requirements. The Authorial Acting Program at DAMU comes out of the humanist and dialogical traditions. It views performance first and foremost as creative public behaviour. We cultivate creativity of body, voice and of mind in real-time by exploring acting through the lenses of different disciplines – this includes theatre performance. Students are encouraged to go beyond traditional forms of theatre, crossing boundaries and drawing on personal experiences in fields like education, social work and psychology. Authorial Acting students are guided towards becoming creative personalities – capable of making and standing by their own authorial solo and group work based on their own personal themes. Students grow psychosomatically and gain experience in key areas of human expression: voice, speech, movement, acting, authorial reading, and Dialogical Acting with the Inner Partner (formerly known also as (Inter)acting with the Inner Partner), but also in philosophy, psychology and theatre history. Studies take the form of weekly studio and lecture classes supplemented with intensive workshops with accomplished pedagogues, theoreticians, performers and authors. What are authorship and creativity and what does it mean to be an author, a creator? How does one discover and cultivate personal themes? How can I / we share these themes in a performance situation, with the self fully and authentically present? What sort of psychosomatic fitness does that require – and how can I study and develop it? What is the social, political, and pedagogical significance of our work? Students pursue multidisciplinary studies, both practical and theoretical, rooted in a psychosomatic (psycho-physical) understanding of the individual (e.g., Stanislavski, M. Chekhov, Brook, Donnellan, Vyskočil, Zarrilli) and a philosophical foundation stemming from humanism, personalism, and the dialogical self (e.g., Buber, Frankl, Fromm, Hermans). Dialogical Acting with the Inner Partner; Authorial Reading (students write and read aloud their authorial texts); Authorial Presentation; Movement (foundational psychosomatics, movement theatre principles, contemporary techniques); Authorial Acting (principles of authorial acting, creating solo and group performances, transforming personal themes into stage pictures); Voice and Speech; History of Theatre; Dramatic Texts Analysis; Philosophy and Psychology as they relate to authorial creation, individuality and the concept of play. Over the course of their studies, students deepen their understanding of their personal themes and learn how to express them in performance situations. The program nurtures and develops their expressive (psychosomatic) capabilities. They also deeply absorb the ethics of authorial creativity. At graduation, students are able to create a text outline of a 45-minute authorial performance and know how to structure its stage form. They understand and can explain the authorial aspects of acting in the context of European culture, and understand the basic philosophical, anthropological and psychological aspects of authorship. Students will also be able to understand and explain the principles of using theatrical approaches in non-artistic spheres. Because our goal is to cultivate self-confident, creative personalities, graduates’ profiles and employment tends to be very diverse. Frequently they work as authors / creators of their own projects of a theatrical, visual, literary, or other nature; some find work in media. Graduates also often work in a variety of pedagogical professions, from youth theatres to universities – often teaching psychosomatic disciplines. Some continue their studies in arts practice based PhD Programs. Students are assessed regularly throughout the two-year for MA, resp. three-year for BA Program, primarily through evaluations of written and studio work. If during the course of their studies students are not keeping up to the standards expected, they may be dismissed from the Program. Students must create a final performance and written thesis in order to obtain the degree. They must also defend this work in a final oral defence of the thesis. They are also required to take final theoretical oral examinations. Students may take an additional year to prepare and present their final performance and write their thesis if they have fulfilled all other graduation requirements.